Spread the green beans on the aluminum foil. Drizzle with olive oil and balsamic vinegar. Use a wooden spoon to stir gently. Sprinkle with salt and pepper. Roast the green beans in the oven for 15 minutes or so, until lightly browned at the edges. Serve. It just doesn’t seem fair to compare balsamic green beans to the same old boiled or steamed version. The deep-flavored, caramelization that occurs from roasting any vegetable, let alone green beans, is outright transformative. Add on the sweet and tangy taste of balsamic vinegar, rich olive oil and a sprinkling of salt and pepper, and non-roasted, balsamic-free green bean dishes can't hold up. Once you’ve tasted these savory yet tangy roasted green beans, it may be difficult to imagine eating them any other way but we're sure you'll love our other green bean recipes too. 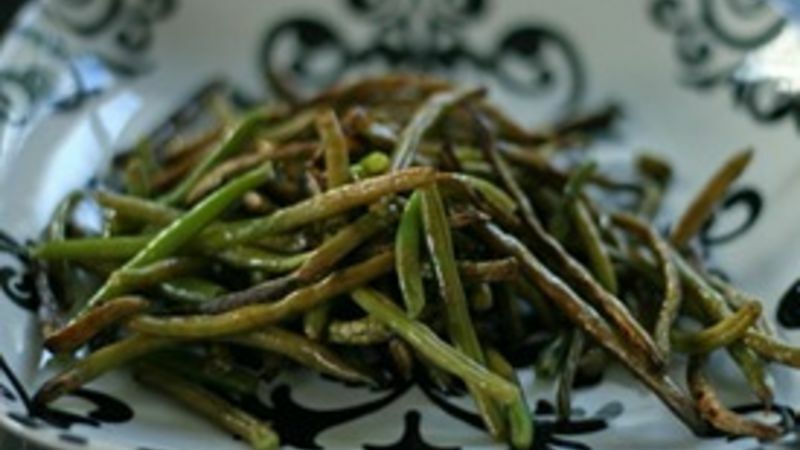 These green beans make for an excellent substitution or a side dish to be served alongside the famous green bean casserole during the holidays.